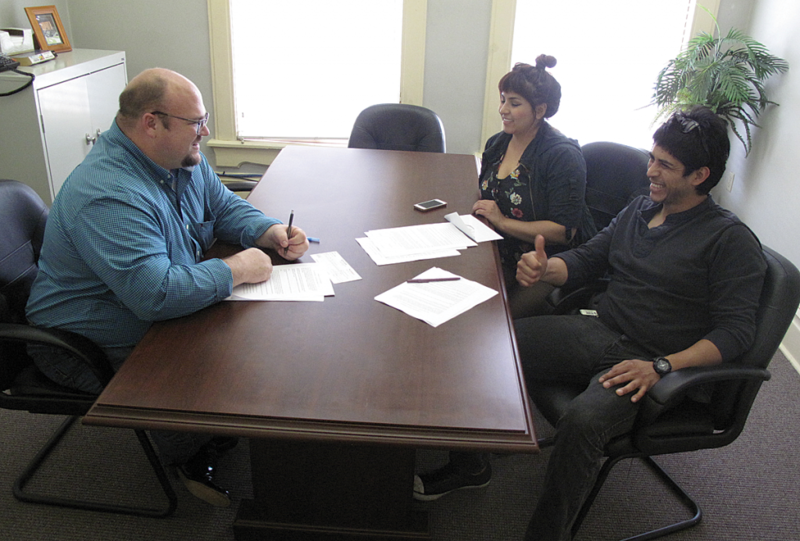 As Patrick Shattuck, real estate and community outreach director for Mon Valley Initiative, looks on, Miriam Strong and Fernando Espejel get ready to sign a lease for their new restaurant in the historic Braddock Free Press building. Along with Maria Delpilar, Espejel and Strong operate Brassero Grill, a successful and popular food truck serving tacos, quesadillas, burritos and other healthy Mexican-American meals. The truck became operational in 2011 and has become a common and welcome sight in the Pittsburgh area at events and businesses. Brassero is now preparing to open its first brick-and-mortar location on Braddock Avenue in the building that once housed the Braddock Free Press newspaper, Guentert’s Bakery, a bowling alley and other businesses. The Free Press complex, owned by the non-profit Mon Valley Initiative, has been thoroughly renovated and provides retail and commercial space for Studebaker Metals, the smartphone parking app Meter Feeder, a variety store, Camp Copeland Studios and the Braddock Inclusion Project, as well as seven mixed-income apartments upstairs. The nearly $2 million project to rehabilitate the Free Press buildings, begun in 2016 and completed two years later, was funded in part by Allegheny County and the federal Department of Housing and Urban Development, or HUD, as well as by MVI. With the addition of Brassero Grill, expected to open this summer, the last large piece of retail space in the Free Press complex will be occupied. For more information about Brassero Grill, follow them on Twitter or Facebook.